Category Archives: Sidford Fields – AONB or business park? All six candidates have been invited to answer the public’s questions at tonight’s hustings, organised by the Sidford-Sidbury Residents’ Group. Don’t miss this chance to assess who will be your best choice. Whatever happens at national level, your vote at the local Devon County (DCC) elections on 4th May will affect your daily life. Sid Valley has experience of this, having being let down by a flawed County Highways report, which initially supported a proposed Business Park site at Sidford. The report was only re-assessed, and the proposal rejected, after massive public pressure inspired by meticulous research from our newly elected District Councillors and the Sid Vale Association (a founder-member of the Save Our Sidmouth, SOS, campaign). Meanwhile, South West Water began drilling boreholes on the ’employment site’ in January this year. Results of their testing for water quality, apparently relating to a possible new supply for a rapidly expanding Sidmouth, are awaited. Categories: East Devon Alliance, East Devon Issues, Knowle Watch, Sidford Fields - AONB or business park?, SOS, SOS in the Media | Permalink. The context of this appeal by Mr Freeman, is the preparation for a “Greater Exeter Strategic Plan” (GESP), with Exeter in partnership with Teignbridge, Mid-Devon, Devon County Council, and EDDC, for the period up to 2040. He explains that it will “address large scale housing sites (around 500 homes or more) and employment sites”, along with associated road and rail networks, and that GESP “will ultimately supersede some of the strategy policies in the Local Plan” www.gesp.org.uk. This morning, Mr Freeman has issued a subsequent e-mail, assuring the public that “Engagement with stakeholders and communities will be critical to the success of the Plan”. He is unlikely to create confidence, given EDDC’s sorry record in this respect: the ongoing Knowle relocation mess is just one prime example. Stuck with the taint of the Graham Brown affair, EDDC’s “call for sites” should be correctly handled. Complete transparency does not fit with hints that some councillors might be “secretly sat on a few acres of land” . How did business-park on-a-Sidford -floodplain come to be in the Local Plan? Categories: East Devon Alliance, East Devon Business Forum, East Devon Issues, EDDC, Sidford Fields - AONB or business park?, SOS | Permalink. Turning our backs on 2016. Raising a glass to the New Year! With seasonal irony, Sidmouth Town Ward Member, Cathy Gardner (Leader of East Devon Alliance), spoke of a revelation by Deputy EDDC Leader, Andrew Moulding as “a miracle”. 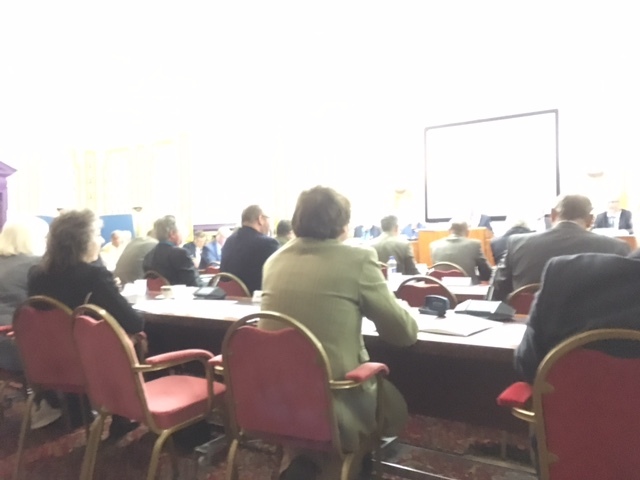 She was drawing attention to Cllr Moulding’s surprise statement a few days earlier, (rather oddly included in a press release on Sidmouth’s beach management plan), that the District Council’s relocation project is “cost-neutral”. Cllr Moulding, looking serious and possibly flustered, did not respond, and disappointingly was not asked to do so by the Chair, Stuart Hughes. But councillors and the public alike will presumably want to know what change has brought about this new “cost-neutral” stance. No doubt all will become clear as 2017 unfolds.. Happy New Year to all who have contributed to the Save Our Sidmouth campaign (There’s a reminder of actions and progress timetabled on the OUR CAMPAIGN page). 2016 has seen curtailed two major developments planned for the Sid Valley : a large Sidford Business Park on a floodplain, with highways problems; and at Knowle, a change from major employment land to restricted (over 60’s) residential use. The outcome may result in a more appropriate type and scale of development to secure Sidmouth’s future as a unique, balanced community and tourist town. But SOS is very aware that the Port Royal and seafront ‘regeneration’, in EDDC’s hands, will be key. So let’s raise a New Year glass to continued active public support for our new EDDC local representatives; to the Neighbourhood Plan Team born of the refreshed Town Council http://www.sidmouth.gov.uk/index.php/neighbourhood-plan ; and to all other Voluntary Groups, notably the Sid Vale Association http://sidvaleassociation.org.uk and Vision Group for Sidmouth http://futuresforumvgs.blogspot.co.uk , and the recently established Sid Valley Residents’ group https://www.facebook.com/sayNOtoSidfordBusinessPark/. All contribute to ensuring that those responsible for re-shaping the Sid Valley, led by Cllr Andrew Moulding, and Deputy CEO Richard Cohen, will get things right. Categories: East Devon Alliance, East Devon Issues, EDDC, Knowle Watch, Sidford Fields - AONB or business park?, SOS, SOS in the Media | Permalink.